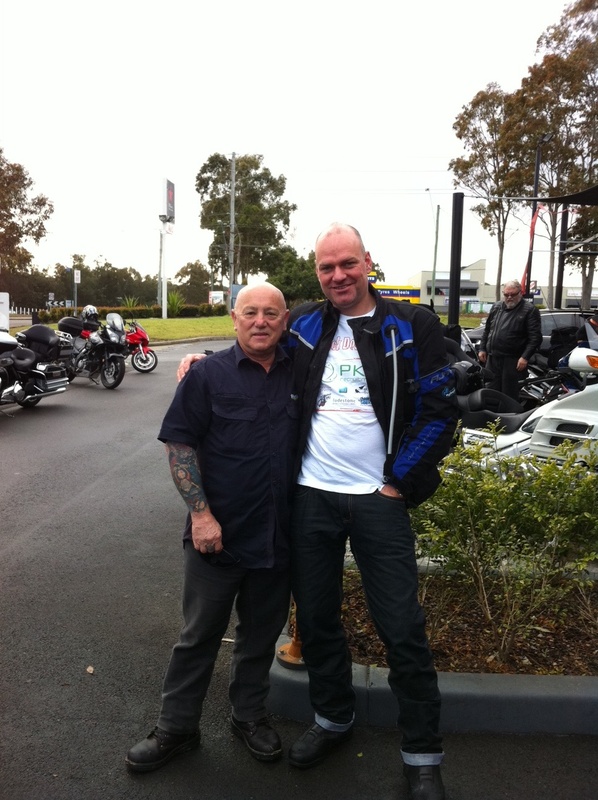 Image: Angry Anderson & Michael Field at the Black Dog Ride farewell breakfast, hosted by Hills Motorcycles. Recently, I blogged about social media for social change. This post reports on the results of a social cause I became aware of through social media and successfully promoted and fundraised through Twitter, LinkedIn and Facebook. Last night I returned from what can only be described as the trip of a lifetime. I rode 3,000km on my motorbike from Sydney to Alice Springs as part of the Black Dog Ride, in support of the Black Dog Institute. The Black Dog Institute is an educational, research and clinical facility offering specialist expertise in mood disorders such as depression and bipolar. I first became aware of the Black Dog Ride when a Twitter connection, Tony Hollingsworth (@hollingsworth) tweeted about it. A few tweets later and I agreed to join the ride – without really knowing what it would involve. The ride commenced on 21 August from Sydney and concluded on 27 August in Alice Springs. We stopped at regional centres and country towns along the way. Stopovers included Young, Balranald, Burra, Port Augusta, Coober Pedy, Alice Springs and finally Glen Helen, 130kms outside of Alice Springs. At the farewell breakfast, I had the opportunity to meet Angry Anderson, the rock legend and lead singer of Rose Tattoo and ambassador of the Black Dog Ride. Angry spoke openly about his battle with depression. I would later discover that many similar stories would unfold from fellow riders as the ride progressed. I learned many things on the ride. There is no stereotype for depression. It can affect anyone, and judging by the mix of riders – it can and does impact many people from all walks of life. The greatest success of the trip is shared in equal measure between the fantastic fundraising result and the tremendous awareness building within the community and the media about depression, bipolar, anxiety and mood disorders. It is appropriate to thank my amazing major sponsor, PKL Recruitment, for helping me far exceed my original fundraising target. Through the generosity of sponsors such as PKL Recruitment and corporate donors such as Ford Health, my current fundraising total is $7,000, making it the second highest fundraising effort, only eclipsed by the founder of the ride Steve Andrews who has raised <$13,500. The total fundraising efforts so far have raised a massive ~$130,000 which is ~$50,000 more than last year. This achievement was only made possible by the incredibly generous donations from individual and corporate sponsors and the power of social media as a communication and distribution channel. To every individual that donated to the cause, I thank you for your incredible support and kindness. If it wasn’t for Twitter, it is unlikely I would have joined the Black Dog Ride. However, that’s not the whole story. The real power of social media was realised when I mobilised LinkedIn, Twitter and Facebook as the primary driver of fundraising and awareness. Apart from the $100 donated by a generous petrol station owner, all of the funds were raised online. The lesson for me is social media is a highly effective tool for influencing social change. It is also a powerful way to keep sponsors and donors connected with a cause and the progress of an event such as the Black Dog Ride. On the ride I tweeted and posted Facebook updates from nearly every location – ensuring my sponsors were mentioned at every opportunity. For more on the Black Dog Institute, or to make a donation, visit http://www.everydayhero.com.au/michaelfieldcom. Just recently I signed up to join the Black Dog Ride- an initiative to help raise awareness of, and money for, depression, particularly among men. In August, a bunch of us are embarking on a week long motorbike ride to the Red Centre- all in the name of removing the stigma that is so often associated with sufferers of depression. But that’s not what this blog post is about- I don’t want to seem like I’m tooting my own motorbike horn or anything. What fascinates me is how my involvement in such a fantastic cause came about- it’s all thanks to social media. The use of social media as a medium to promote social change is growing rapidly, and I have found, in my own experience, that it is a remarkably effective way to promote a social cause to a wide and diverse audience. My personal experience began with a Twitter connection of mine, Tony Hollingsworth ( @hollingsworth ), tweeting about the upcoming ride. That’s all it took to grab my attention. I contacted him (via Twitter) enquiring about the ride and the rest, as they say, is history. The same can be said for not-for-profit organisations making use of social media- like the RSPCA. Following the now infamous Four Corners animal cruelty episode, the RSPCA tweeted links to sign petitions and constantly refreshed their feed with news articles related to the issue. Social media is everywhere now- it cannot be avoided. The ways it can be used to influence social change are limitless. With social media comes the ability to constantly update people with new content- be it a new petition to sign, a new cause to get involved in or a new donation to be made. That is not to say that traditional forms of media are not doing a good job in terms of social change and awareness. Social media, however, can advance that awareness in a domain that is more ‘public’ in the sense that anyone can have a say and participate- it is an ongoing conversation. Twitter is ideal for people who want to share their views on a particular cause and find other like-minded people supporting similar charities to them.